Are you at your wit’s end with nuisance barking and ready to find the best citronella bark collar for small dogs? Look no further and rest assured because we have your back when it comes to stopping naughty barking. We took the time to research and explore a multitude of options, coming up with a list of the best options available with real-deal reviews. We know the market is saturated with quick fixes that don’t pan out along with harmful fakes that make owners wary. We also understand how important it is to stop nuisance behavior in a humane way that won’t leave Skipper feeling any pain or discomfort. Careful research and review has narrowed the field to a clear list of winners, fishing out the top performers in a sea of options. Aren’t Dogs Suppose to Bark? Why Should I Stop It? Nuisance barking is a real problem, leading to tense relationships with neighbors and even your own dog. A dog that is guilty of nuisance barking carries on continuously at inappropriate times, whether they’re incessantly barking at neighbors outside or barking at every single household noise. It can be a serious problem in apartment communities, where tenants can be evicted for such noise violations. In addition to stopping the dog out of courtesy to others and your own sanity, you can should curb excessive barking to set boundaries, establishing rules with your dog and asserting yourself as pack leader. Is a Citronella Bark Collar Good for Training Small Dogs? A citronella bark collar is a pain-free way to stop a dog from nuisance barking. It works by releasing a burst of citronella spray when a dog barks. The spray is harmless but smells unpleasant to the dog. They then associate barking with the smell, ceasing the behavior. It detects the bark by sensing the vibration of vocal cords or using a microphone. Some collars also come with a manual remote for use. Citronella bark collars are a great choice for training small dogs, as there’s typically no need to adjust settings like in electroshock collars and no risk of pain for the dog. Are Citronella Bark Collars Safe for Small Dogs? Yes, citronella bark collars are safe for use with small dogs. They do not cause the dog any pain, unlike shock collars according to the ASPCA. Is the Citronella Dog Collar a Safer Alternative to Electric Shock Collar? While an electric shock collar used properly is not cruel, it is painful for the dog when they bark. Some collars may pick up other vocalizations or panting, erroneously shocking the dog. This can traumatize the dog and lead to fearful behaviors such as hiding or urinating. According to the Humane Society, misuse of shock collars is a problem. With citronella bark collars, there is no fear of such pain. Dogs are not subjected to any discomfort other than a mild spritz of unpleasant citronella spray. How Do I Pick the Best Citronella Bark Collar For Small Dogs? Picking a citronella bark collar isn’t as tough as it sounds. You want to ensure you have a measurement of your dog’s neck handy. You can do this with a measuring tape around the dog’s neck or by taking their collar off and measuring the length. Despite being a small dog, they come in all sorts of shapes and sizes. For instance, a pug’s neck is much thicker than a chihuahua’s. You want to make sure you measure to buy the correct size. Size small is not a one-size-fits-all in the small dog world. You also want to make sure the brand features a citronella sprayer that is not too large or bulky for your dog. Again, a pug will be more comfortable with a larger unit than a chihuahua. Once you purchase the right size, you want to ensure a proper fit by attaching the collar around your dog’s neck, with the sensor firmly but comfortably against their vocal cords to detect vibrations. How Do I Train My Small Dog Using a Citronella Bark Collar? To train a dog using a citronella collar, you need to purchase the proper size collar and attach to your dog according to the instructions. You want to be sure your dog is comfortable and relaxed with the new addition and keep training consistent. Don’t confuse your dog by sometimes allowing nuisance barking, only to apply the collar later on. Dogs need consistency in their routine to learn and grow as your companion. As with any training collar, do not leave on your dog for more than eight hours at a time and monitor your dog’s neck for any sign of irritation. Do Citronella Bark Collars Always Work? Like with any training device, there isn’t a guarantee that a citronella bark collar will work for your dog. Some dogs have barks that are too high pitched to be detected. 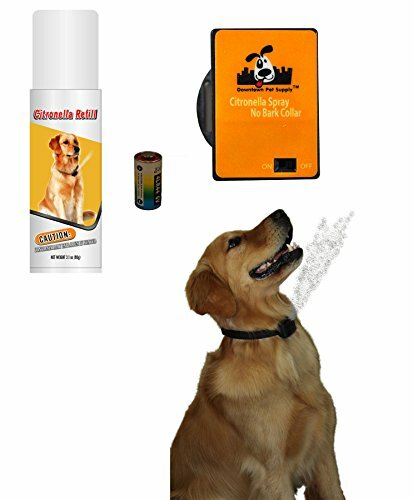 Other dogs simply bark through the spray once they grow used it it. For dogs like these, there are additional training methods that can be explored that don’t require the pain of electric shock. Since the shock does cause pain, it should be reserved for the most extreme cases of nuisance barking. 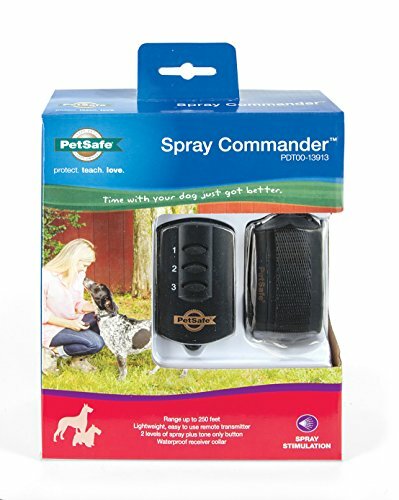 The Petsafe Spray Commander Dog Training Collar is a versatile training tool that uses either citronella spray or beeps to correct nuisance barking or behaviors. It is a manual trainer, requiring owners to correct the dog with a remote control vs detecting barking automatically. The training collar comes with a discrete, small remote control that is pocket friendly and perfect for dog parks and walks. It allows you to correct your dog on the go for behaviors other than barking. It also has the option to skip the spray and switch to beeps only if you choose. Despite its fare share of perks, the collar does have its drawbacks. There is no automatic option available, requiring owners to be present to issue the correction.Not very helpful if you need it for when you’re out of the house or if you misplace the controller. Yikes. There is also a relatively limited range to this one compared to other collars, would only be useful in the house or in a smaller yard. The Downtown Pet Supply NO BARK Collar Citronella Spray Collar Kit is an automatic training collar, releasing citronella when it senses a dog’s bark. This may be a better option for longer-necked breeds like Italian greyhounds, not pugs, but is does do its job well. It has its fair of share of winning points including that it allows for peace of mind when you are not around, ceasing nuisance barking in your absence. There is no need to worry about issuing the correction yourself, as the device detects the bark and corrects accordingly. I did like the collar and it served its purpose as far as issuing correction, but there were a few sour points with this collar option in my house including that it is Bulkier than the first option with a slightly awkward vertical positioning of the sensor, making it not short-neck friendly. PetSafe Gentle Spray Bark Collar for Dogs is another automatic collar that detects vocalizations in order to deliver a corrective spray. It’s a middle of the pack option, but like the other options, it has its share of pluses and minuses. While I appreciated its outdoor-friendly design more than the second collar, it does have a few areas that could use improvements as stated above. Remote Citronella No Bark Dog Training Collar is a remote-controlled collar option, allowing you to release a spray when you see fit. It’s a great tool for one-time correction or ongoing use. It is valuable for several reasons. While I appreciate some of the features of this collar, there were some weaker points as mentioned above. The product could benefit from design improvements. 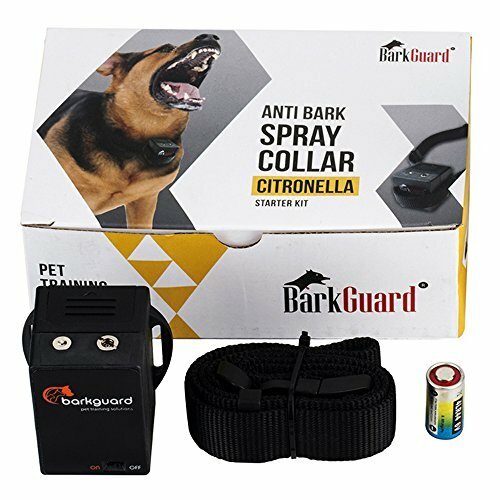 The Barkguard BT-88C Citronella Automatic Anti Bark Spray is another convenient automatic option for hands-free correction. It’s a solid choice when it comes to stopping nuisance barking in its tracks and has a few notable perks. This is a nice option compared to many options out there. While it does its duty as designed, the collar does have a few weak spots. Any further improvements to the product will greatly increase its value. When it came down to it, the best citronella bark collar for small dogs was the Petsafe Spray Commander Dog Training Collar. 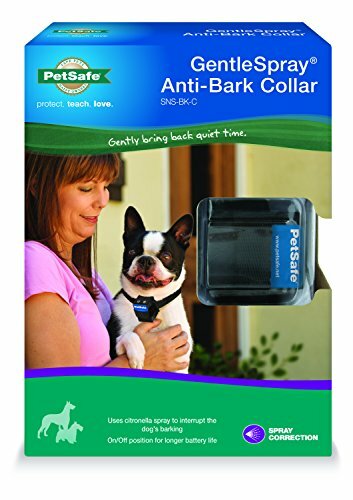 Despite being remote-based, the collar worked the most consistently when it came to immediately ceasing nuisance barking. It was also versatile and comfortable, allowing me to use it to correct other behaviors. The collar does not spray your dog unless you press the button, avoiding improper sprays that automatic devices may administer and allowing for a consistently positive experience for the dog as long as they obey commands. While the range is a big tight, it works well around the house and in smaller backyards. It’s also portable enough for use on the go, allowing owners to correct behaviors as needed.